Enterprises are now connected internally and externally to other Enterprises via the Internet in ways that are increasingly difficult to manage, especially as these interconnections become more dynamic. Current methods of coordinating the effects of change as they propagate through these networks of connections are not likely to scale. What is needed is a new paradigm for how the Internet supports such coordination. Indeed, the Internet should and could provide fundamental coordination functions that are missing today. In this talk, we describe how such a "Coordinated Internet'' would work. The key functionality of a Coordinated Internet would be that the Internet actively watches what people do (analogous to search completion on desktops today), correlates these activities, and actively notifies people when and how their current tasks affect and are affected by the activities of other people. This would be accomplished by standard coordination functions implemented as a common Internet layer that can be used as a utility by more specialized applications. Such a Coordinated Internet would revolutionize enterprise management, for all enterprises, large and small, corporate and personal. For example, static workflows would become obsolete for all but the the most routine processes. Some solutions provide existence proofs of such a coordination substrate, such as the Redux solution in concurrent engineering, which we describe herein. However, foundational research remains to be done in the new field of Coordination Engineering in order to reach the goal of a future Internet in which coordination functions are fundamental. Charles Petrie is a Senior Research Scientist working in the Stanford CS Logic Group. His research topics are concurrent engineering, enterprise management, and collective work. 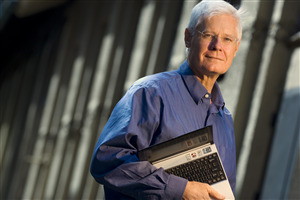 Dr. Petrie was a Founding Member of Technical Staff of the MCC AI Lab, Founding Editor-in-Chief of IEEE Internet Computing, and Founding Executive Director of the Stanford Networking Research Center. He is the Founding Chair of the Semantic Web Services Challenge. He received his Ph.D. in Computer Science from The University of Texas at Austin. A more complete biography is available here.